Two great hydraulic powered models to choose from. Shaver's lineup of hydraulically powered diggers includes two models. The Model 510 gives you 700 foot-pounds of torque and requires 5-10 gpm. The Model 1020 offers 1,000 foot-pounds of torque with a hydraulic requirement of 10-20 gpm. Shaver offes a wide variety of augers, including diameters from 4 to 30 inches. Our augers come in a standard length of 42 inches and are available in semi-double flight and double flight. Bolt-on auger extensions at 9 and 14 inches are available when added depth is needed. Both models feature a variety of auger width options ranging from 4 to 14 inches (24 inches on the larger Model 1020). Our hydraulic post hole diggers offer easy assembly and mounting, as well as a variety of mounting options: boom/three-point mount, bolt-on bucket mount and skid loader fast-tach mount. When it comes to reliability, both units have totally enclosed gearboxes with limited five-year warranties and hydraulic motors with limited one-year warranties. Plus, they have only a few moving parts to ensure a long machine life. 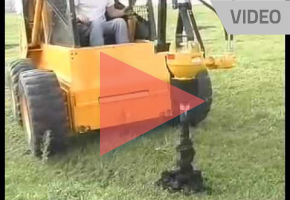 Check out the media available for Hydraulic Powered Post Hole Diggers. Post Hole diggers give you the power to dig holes to the depth and diameter you want quickly and efficiently. 5-10 gpm, 1,500-3,000 PSI, 1 1/4" output shaft, max. torque 700 ft. lbs. 10-20 gpm, 1,500-3,000 PSI, 1 1/4" output shaft, max. torque 1,000 ft. lbs. 9" and 14" 9" and 14"
The specifications for Hydraulic Powered Post Hole Diggers are subject to change without notice. Shaver Manufacturing is a leading manufacturer of skid steer and 3-point hitch attachments. We manufacture a complete line of post drivers, post hole diggers, stump grinders and the Predator extractor. American Made in the Heartland — Graettinger, Iowa. © 2012 Shaver. All rights reserved.